We have had a cold and snowy winter to say the least here in New England. Having cabin fever is an understatement! This week Wesleigh and I took a trip to Hart Farm to check out their green houses and to feel the sun through the green house windows, sans wind chill. I am counting down the days until warmer weather, but this was the perfect place to get inspired and excited for spring. There were some pretty bundles of flowers so I grabbed my floral tape and and wire to make my little sprite a floral crown. Tocoto has beautiful handmade vintage-like clothing for babies and children. I love their designs and the quality is perfection. The spring/summer 2015 line is filled with dresses, rompers and bloomers that are soft and durable. This white ruffled romper is one of my favorite things I have ever bought for Wesleigh! 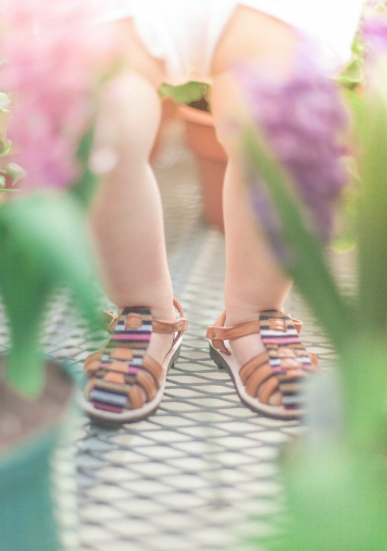 The sandals where too cute to resist, from Shop These are the Days, my “go-to” for all things boho baby. The flower crown is super easy you can do it at home with these 3 tips! 1. Use a “coated” or “wrapped" floral wire for the base-don’t use unwrapped wire, a baby’s head is too delicate for sharp wires! Measure around the babies head and cut to desired length then twist the two ends together so you have a circular base. 2. Buy small flowers or berries that have a study stem like lavender, garden roses, hypericum berry, flowering oregano, dahlia, rosemary. Cut the stem short then take the floral tape and wrap the stems around the base, adding a new flower once the first is secure. 3. I love this floral tape, I break off 3 inch sections which usually secures 2 floral stems onto the base. Sometimes I place florals all the way around the base, and other times I love the way it looks with just a small gathering on one side. *you don’t need fancy floral supplies! You can get all you need on Amazon! No floral cutters necessary! Ring: Gypsy Soul Rings *local vendor love! !